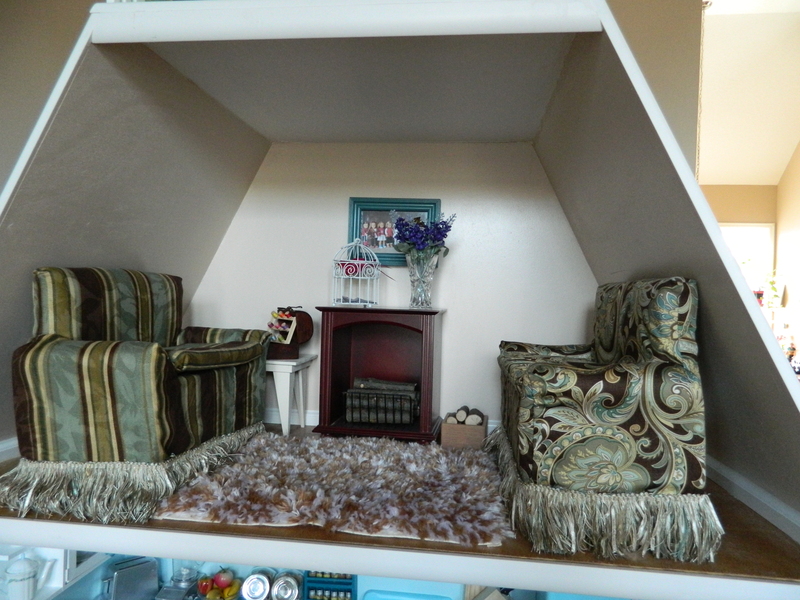 I seem to spend more time on the dollhouse rather then writing about the work being done. Much of the work seems pretty routine and, well, obvious, so I am not writing about everything I do. If you ever have questions about something that I’ve done, please ask and I will elaborate. Sometimes what seems straightforward to me is confusing to someone else. And vice-versa. So much of the work done over the past couple of weeks has been about getting the basics done so the furniture can go in. 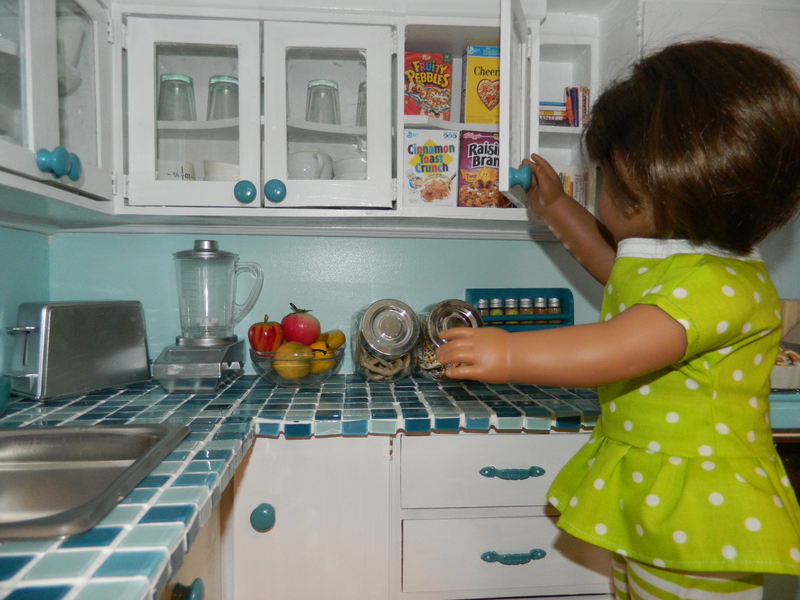 Of course, the kitchen is primarily “basic”, so a lot of work has been done there. 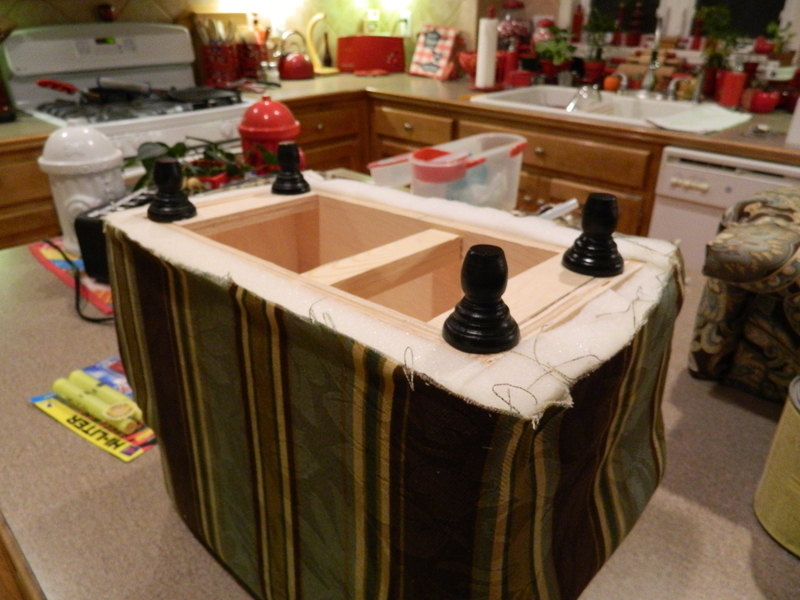 I’ve also done a lot of prep for the doors, floors and trim. I can see the light at the end of this tunnel! The greatest amount of work (and fun!) was the kitchen. 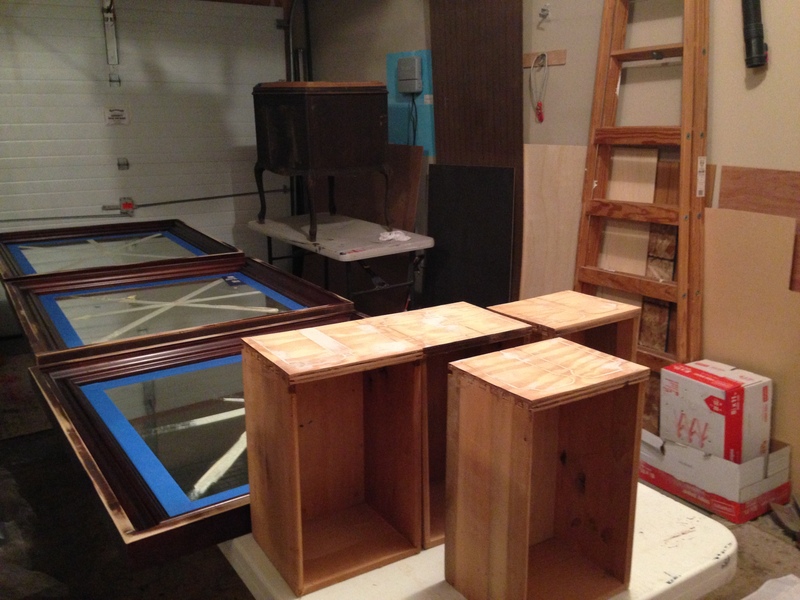 I had ordered all of the cabinetry in kits, that is, I had to assemble it all. 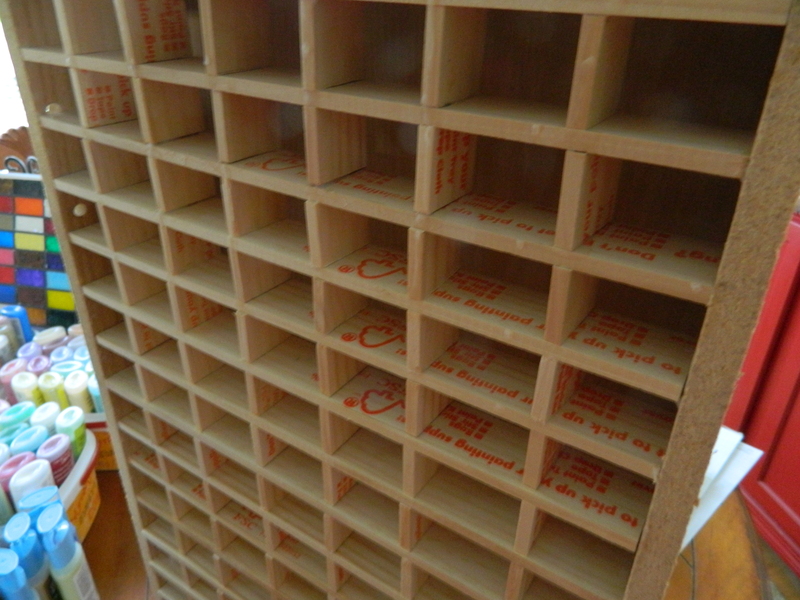 To make sure it all fit correctly, I made templates for both the walls and floor so that it would fit in like a puzzle. I used pieces of laminate that I had ordered from Wilson (ordering info further down the page). 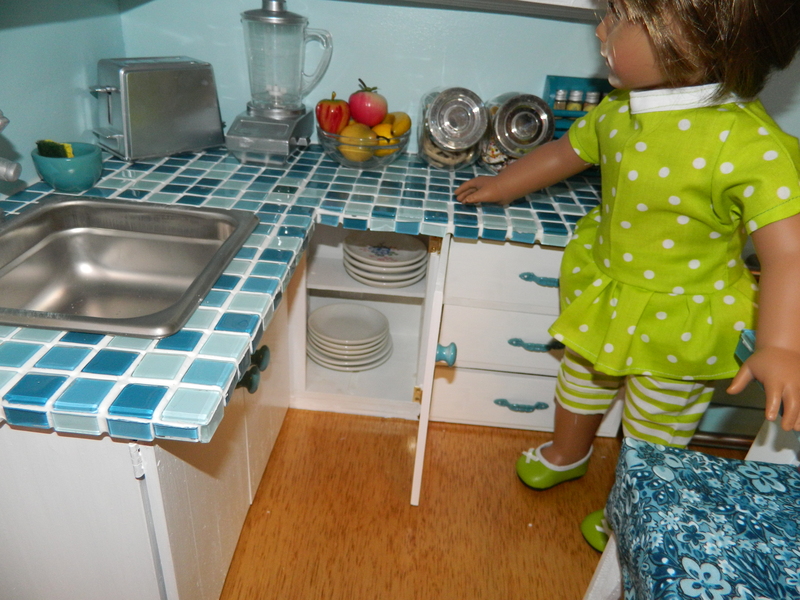 The way it worked out, that back piece acted as a “plate” that the cabinets could be glued to and then placed into the house. 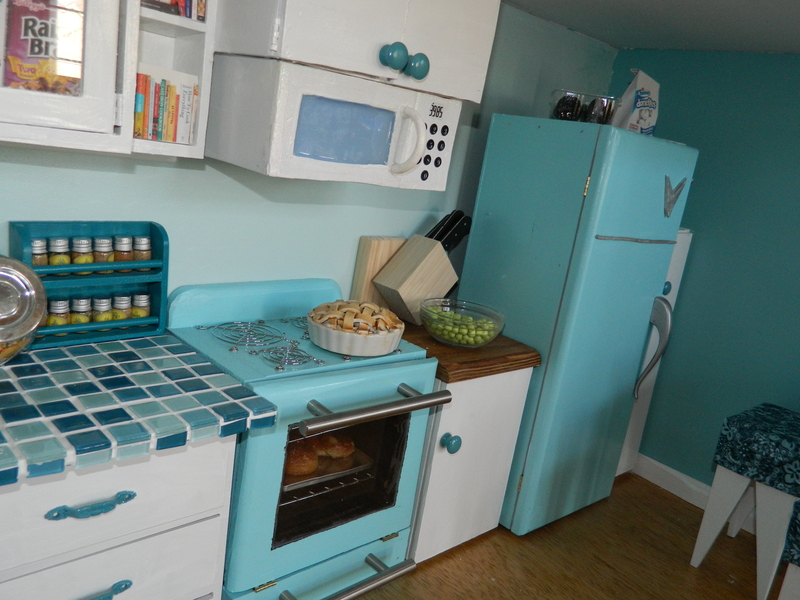 And as a bonus, it became the backsplash, a jaunty little fiftie’s motif in red, white and turquoise. 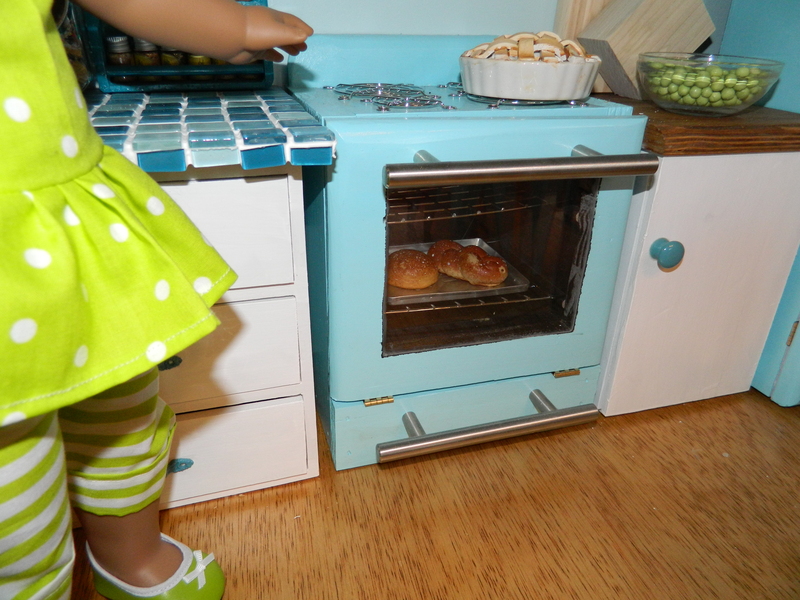 This was the short “stove” wall… The Kid created the range hood from stainless steel. Initially it was a little short, so I added the little cap at the top. 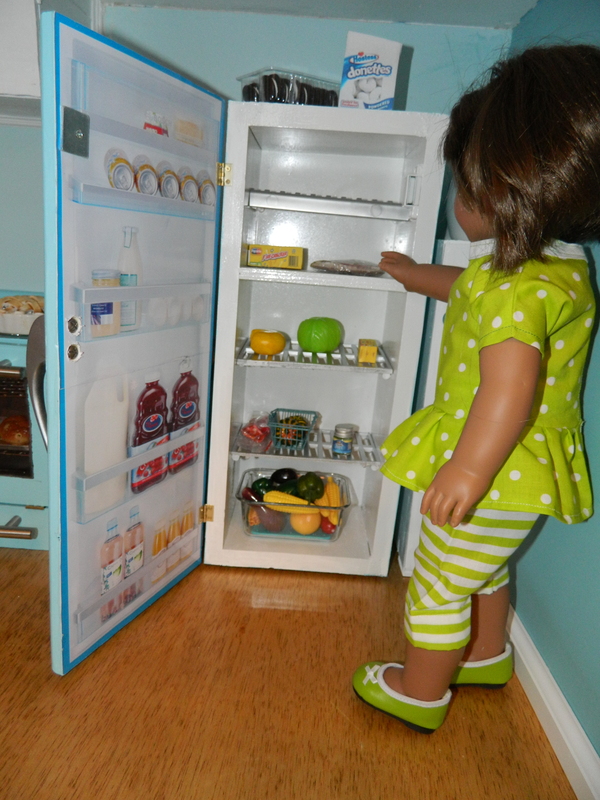 A shot of the long wall with kitchen sink and ‘fridge. I still had to cut the section for the window. The floor is actually another pattern of laminate sample. The only issue I had working with it was weighting the flooring down as it dried. You can kind of get the sense of the air pocket under the floor in the photo above. 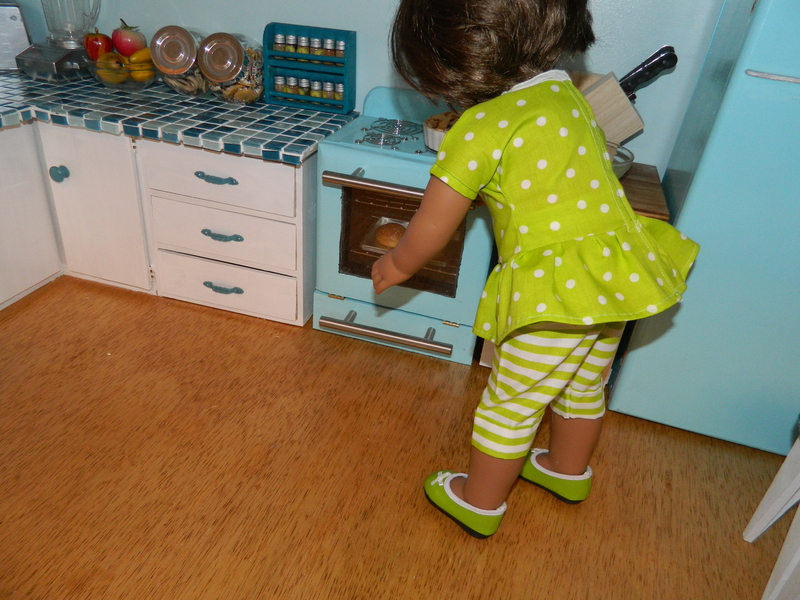 With much of the dollhouse complete, I finally moved it off the kitchen island back in front of the fireplace. 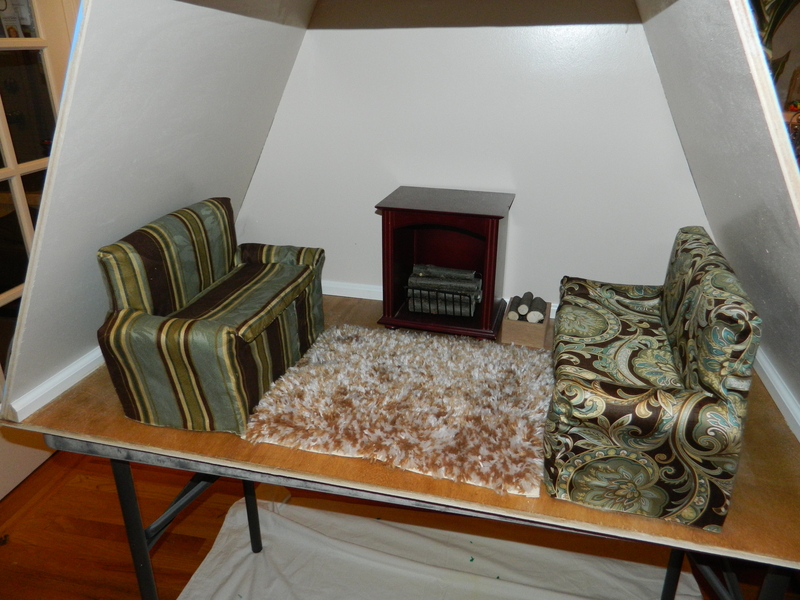 Much of the window treatments are done, furniture found and purchased, and lots of little details being worked on. 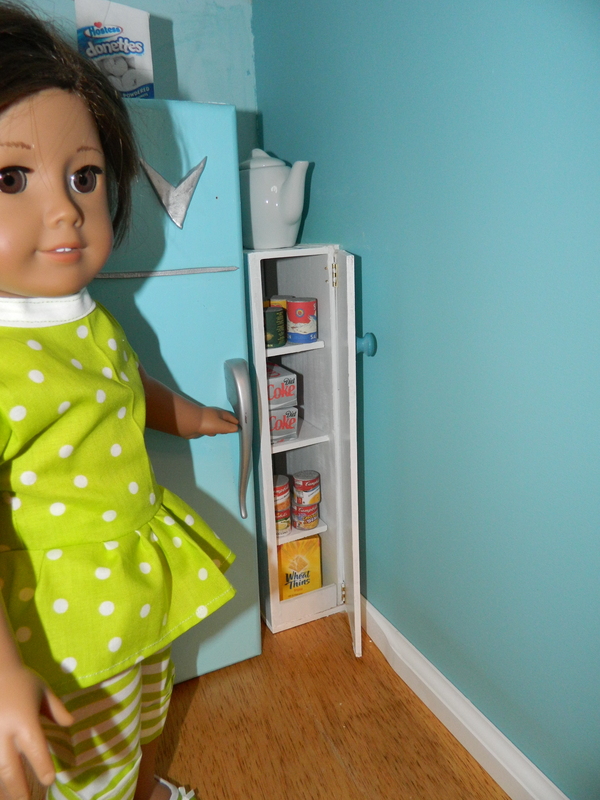 One thing I goofed on was adding the baseboards before installing the doors. I was waiting on the purchased hardware to arrive and just got ahead of myself. Now that it has arrived (and changed from brass to silver finish), I’ve prepared all the doors for installation. I think this is going to be a bigger deal that it should, considering that I think I will need to trim the baseboards to fit the doors. 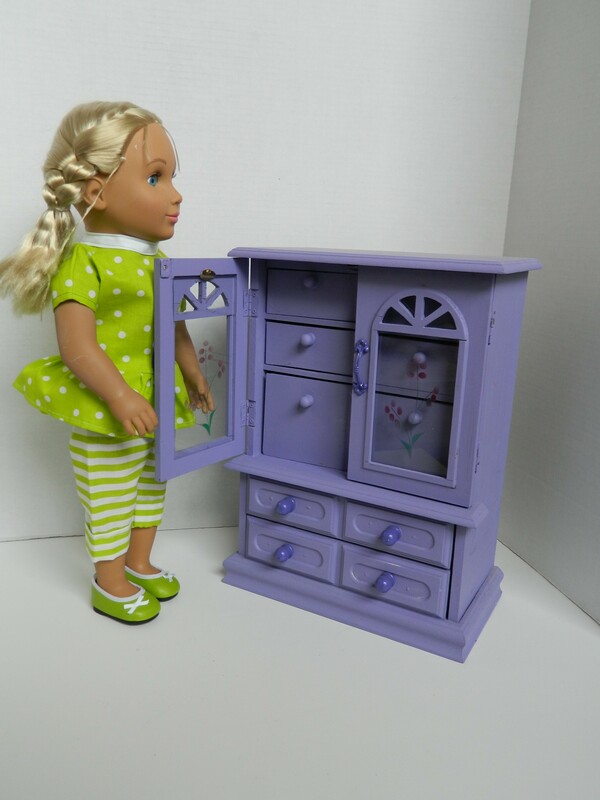 Larger than most starter dollhouses, it requires quite a few doors (and the two inside/outside doors are already installed)! 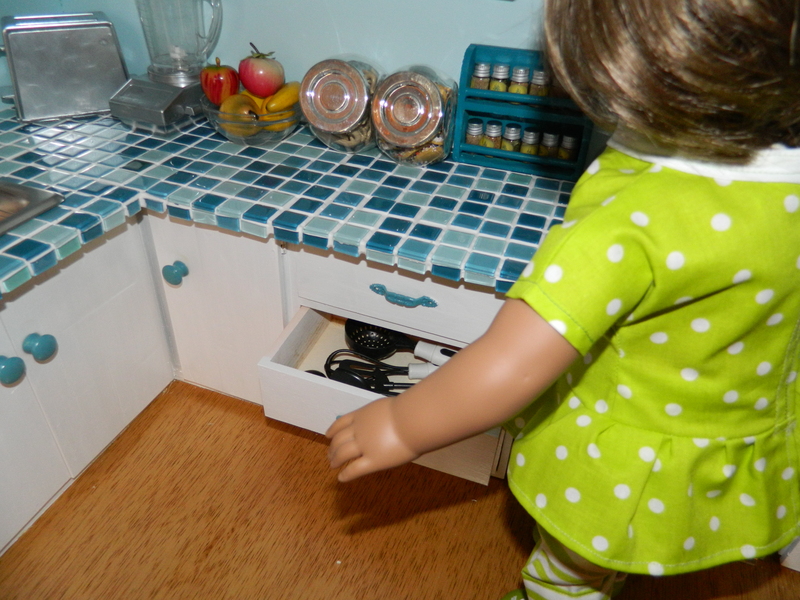 Here I was adding the door knobs. As I mentioned, the pre-purchased door handles were all brass colored. 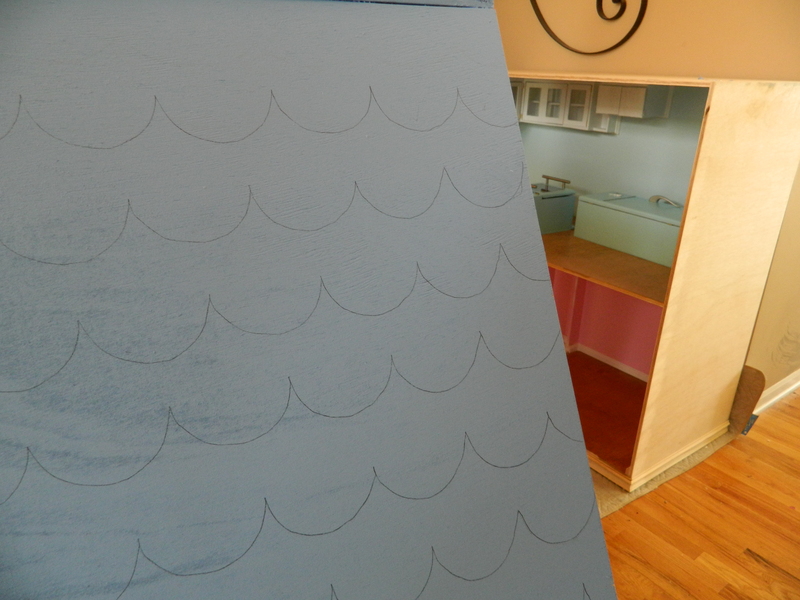 Laying them onto a sheet of poster board and securing them for painting with a glue stick. You can also see a few of the miniature trivets that I purchased off the internet. 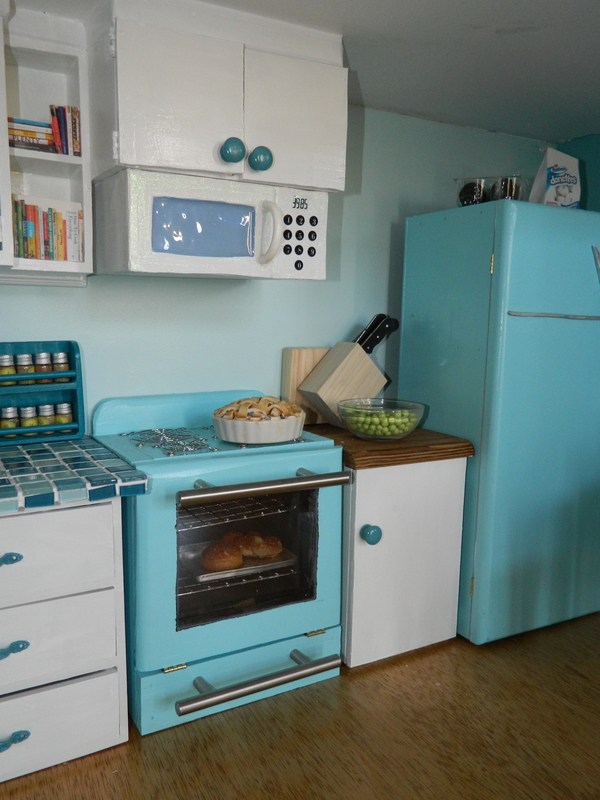 Since the kitchen is red and white with a pop of turquoise, some of the trivets had to be sprayed painted. 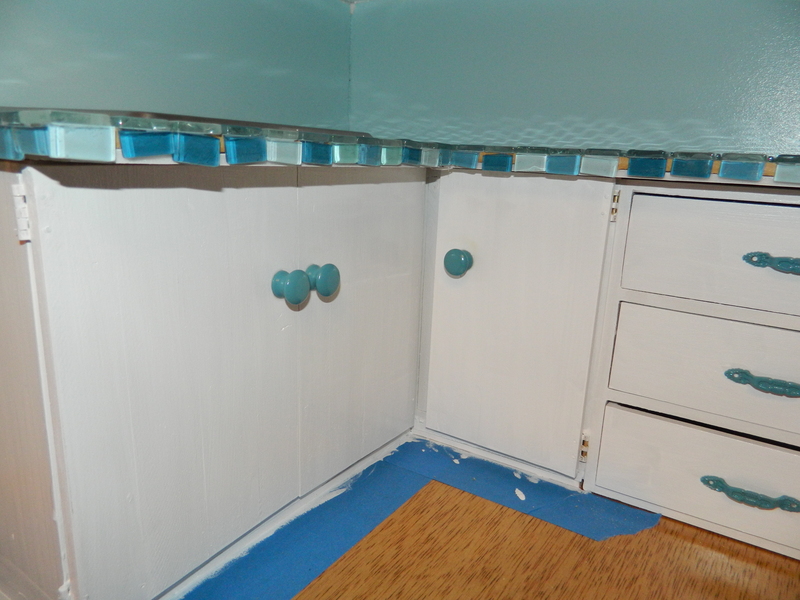 The doors between the dining room and kitchen were designed to open together, instead of knobs, I made push plates. 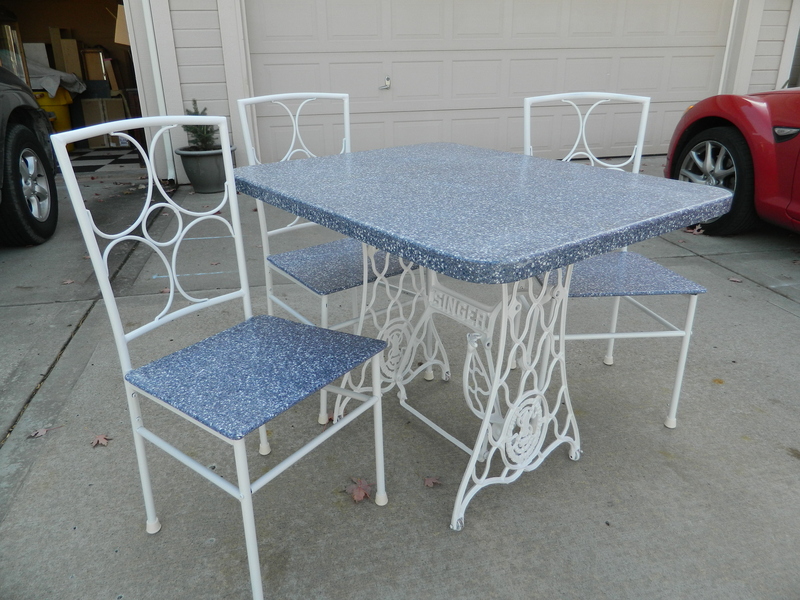 I cut these from metal-look laminate as well. I had several selections to choose from, here are a couple of the sample tiles. They really look like metal! While I was at it, I cut kick plates for the front door as well (to be installed at a later date). 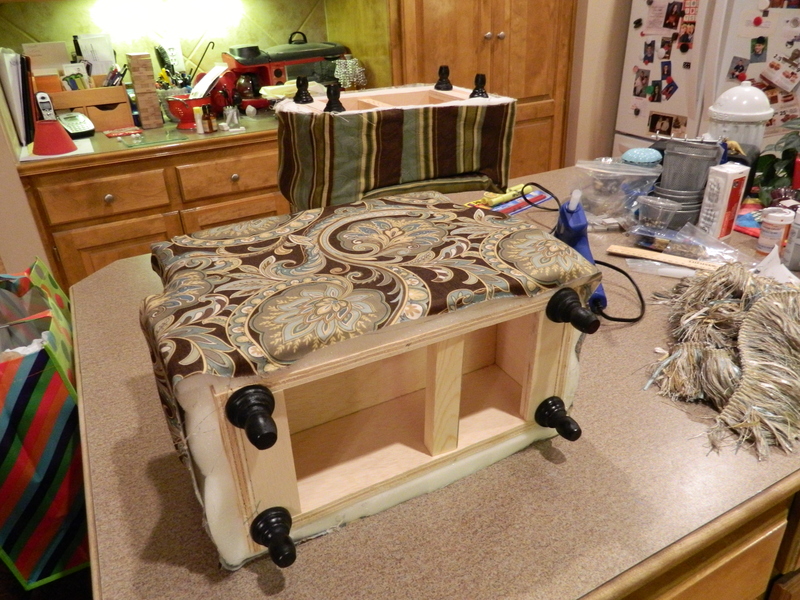 Things are progressing and am quite close to adding the details. And then a gigantic photo shoot will occur to show off the whole thing. Down the road a little ways, I am planning to add clear plexiglass doors to keep the house from getting dusty. Initially I thought I wanted to finish it and then never touch it again, but instead of a single sheet on the back of the house, I decided to construct two larger doors for adjustments or so new items can be added. 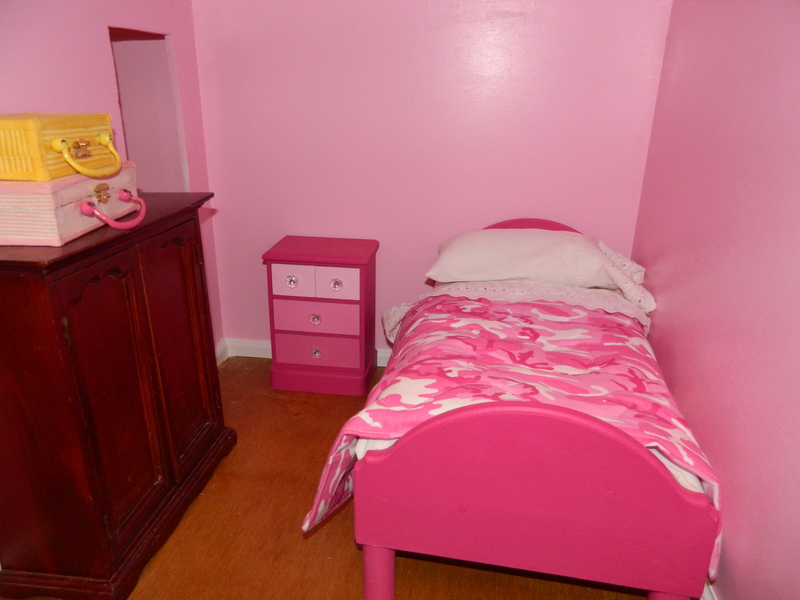 I am also going to place a clear “wall” onto the back of the boys’ room. 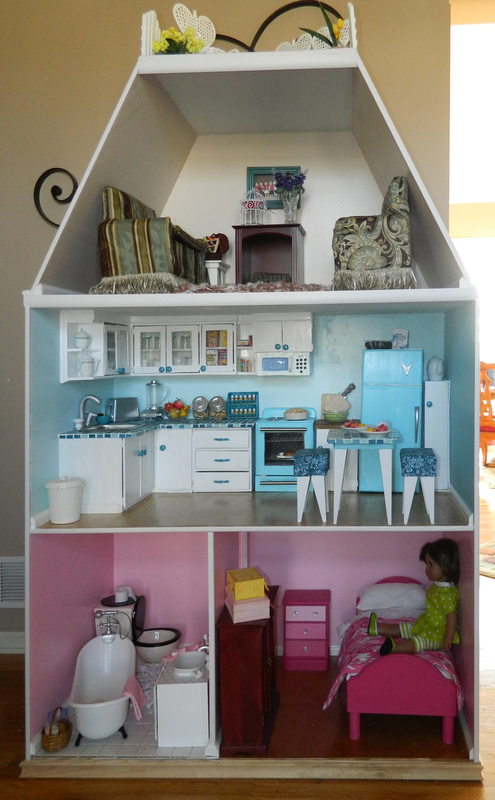 When I started the project of completing this dollhouse, I vowed to work on nothing else so as to not distract me from the task at hand. I have a little bit of crafting ADHD and tend to easily get drawn into other projects and consequently end up with a lot of unfinished projects. Now it seems that I should be finishing up the house at about the same time I will be going back to work! I will work furiously to get all the little details written about in the next couple of weeks. And please! I love to share my projects and the way I went about doing things. But I love to hear from others as well… comments and questions are the icing on the creative cake! I ran across a gorgeous printable for 2016 calendars. I’m generally not much of printed calendars, I am a devotee of my iPhone and computer calendars. But when I saw this calendar I knew I had to print this one. My first thought was to print these one to a page and then flip them over and print an image to the other side. Unfortunately, my printer setting was configured to print on both sides, so I ended up with that printing first. Then I printed out another set, this time one to a page. Tough photographing the calendars, but these are very suh-weet! Trust me! I am going to have these bound on the side, I think, and use these in my office. So, back to the second attempt. Finally, with the 12 pieces of card stock printed with the calendar, I fed them through the printer so that the image printed on the other side. That worked well. 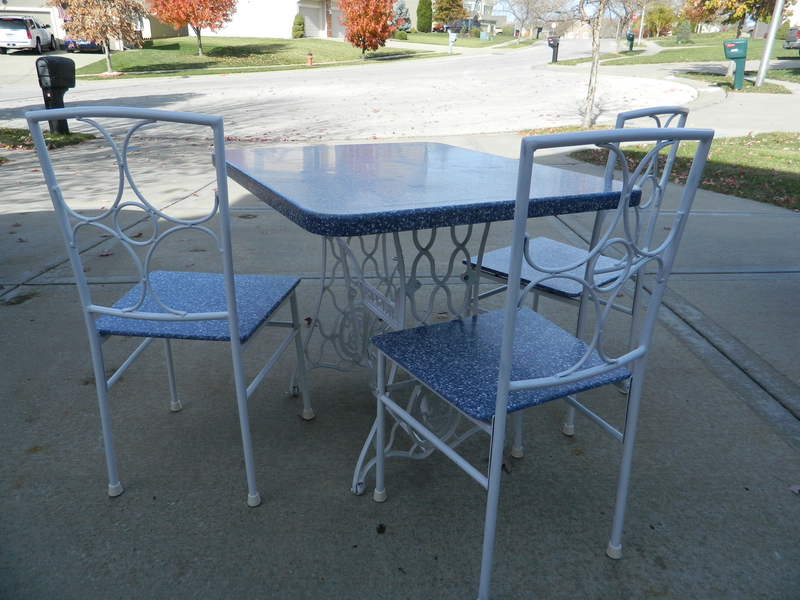 I think that I will have these bound at the top and use these in my kitchen/dining area. Not sure where I found the images – I have a collection of over 3400 images that I’ve collected over the years to cycle through as my screensaver images. But I have them in a series of colors – about fifteen in all – and so they were perfect for these calendars. You can find these free printables over here at Delineate Your Dwelling. Spend some time checking out this great blog! I can’t believe that I am actually ahead of myself at this point! Whew! We’ve finally completed this project. It has been a long time in the making, but I finally was able to get it done with the help of The Kid. So, you can see the starting point here, but I will give you a quick catch up. Months ago, I picked up several pieces of blue Corian countertops, including a smallish rectangular piece that I think was the counter surface for an island. Wasn’t quite sure of what I was going to use it for, but when something like that pops up on CraigsList, you get it while the getting is good. 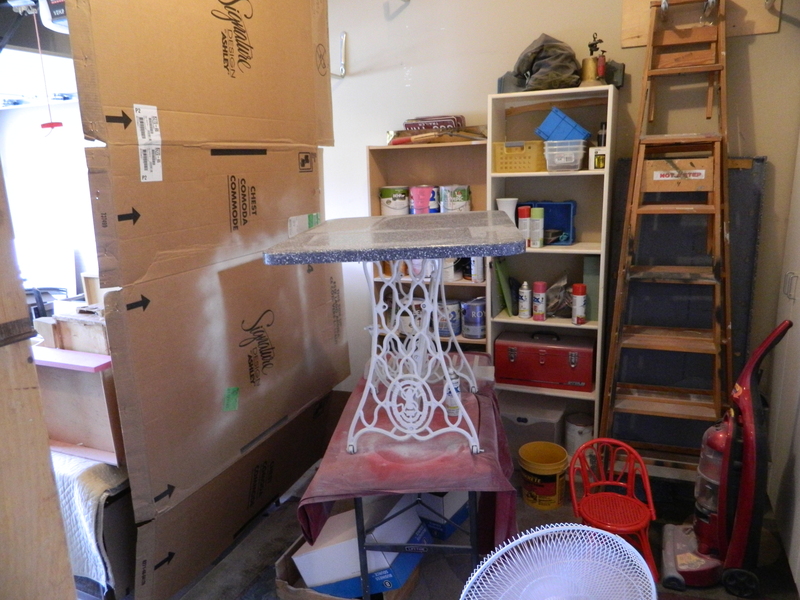 I had the sewing machine base from one of our abdandoned house hunting trips and had spray painted it white, sort of as a primer. 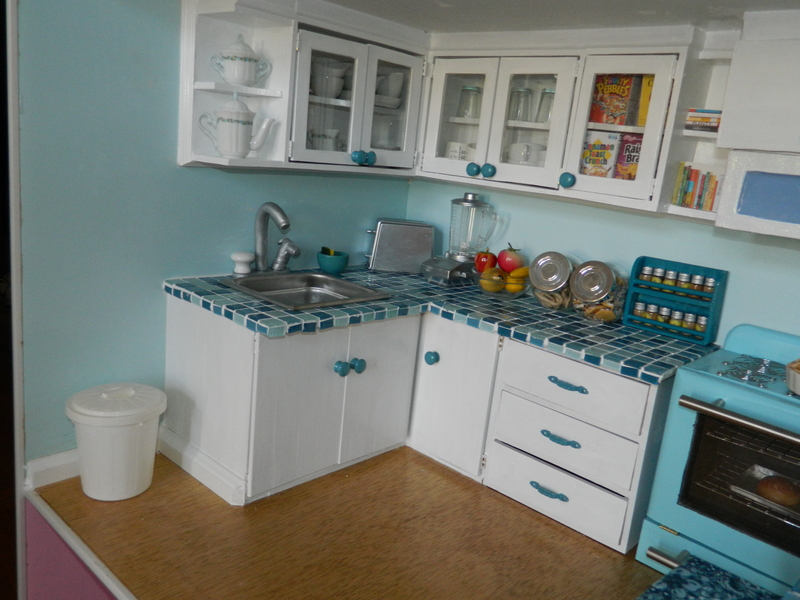 But once I saw the countertop, I knew it was a match made in heaven. Literally, all I had to do was set the top on the base and I could see something really unique. 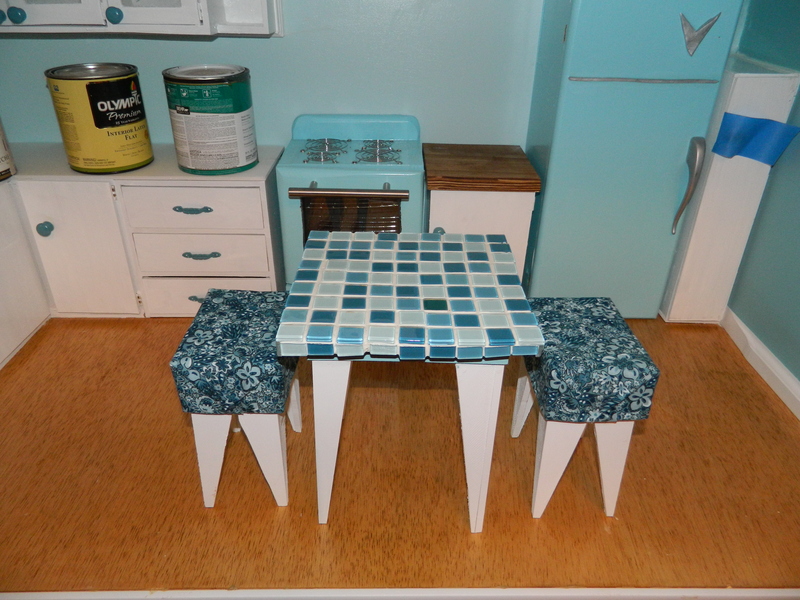 Initially I was going to just make and sell the table, but I figured it would be cooler if there were a set of chairs to go with it. I kept an eye on CraigsList and almost like it was scripted, a set of four popped up. 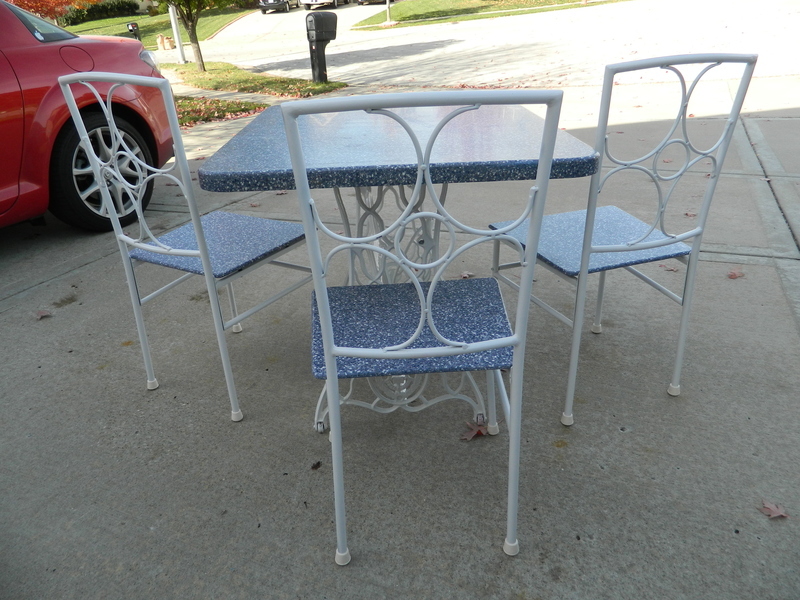 Now they needed work (of course they needed work, else they wouldn’t be on CraigsList for free) and I opted to pick them up, thinking I could get two good ones if I used the other two for ‘parts’. As luck would have it, three were salvageable. 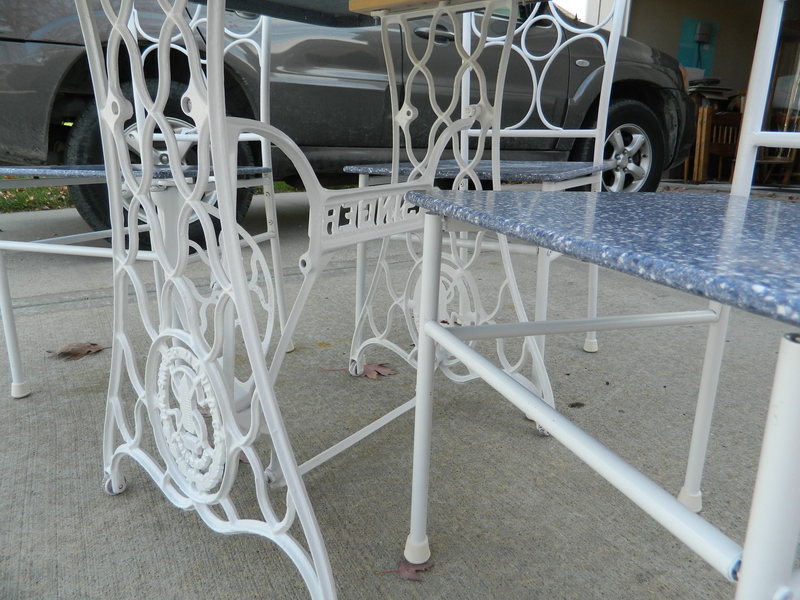 After removing the seats, I then spray painted everything with high gloss white spray paint. This was not an easy task. It seemed every time I thought I was done, I would turn it upside down or stand at a different angle and would see areas that I missed. I think I have them completely painted now. 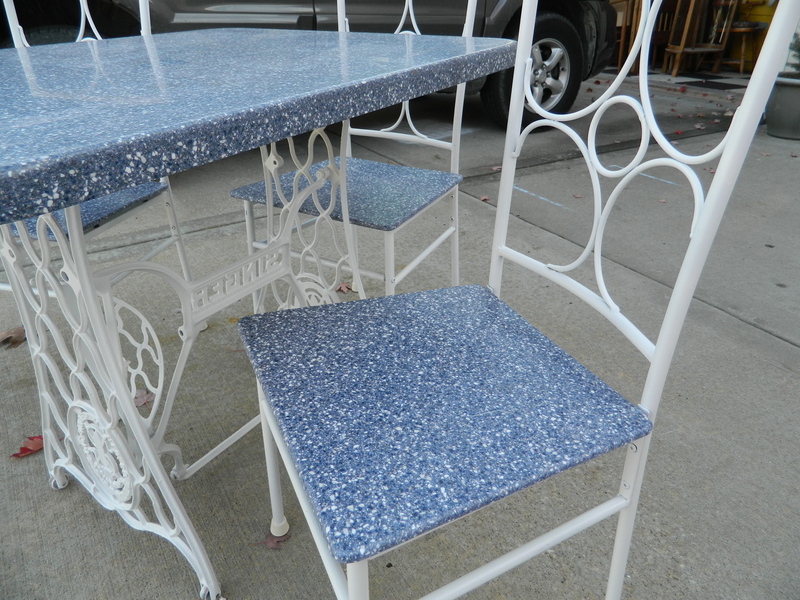 I used the seat that came with the chairs as a template and we used more of the Corian countertop for the seats. The Corian worked much like any hard wood, and we were able to route the edges and drill holes to attach the seats to the chairs. 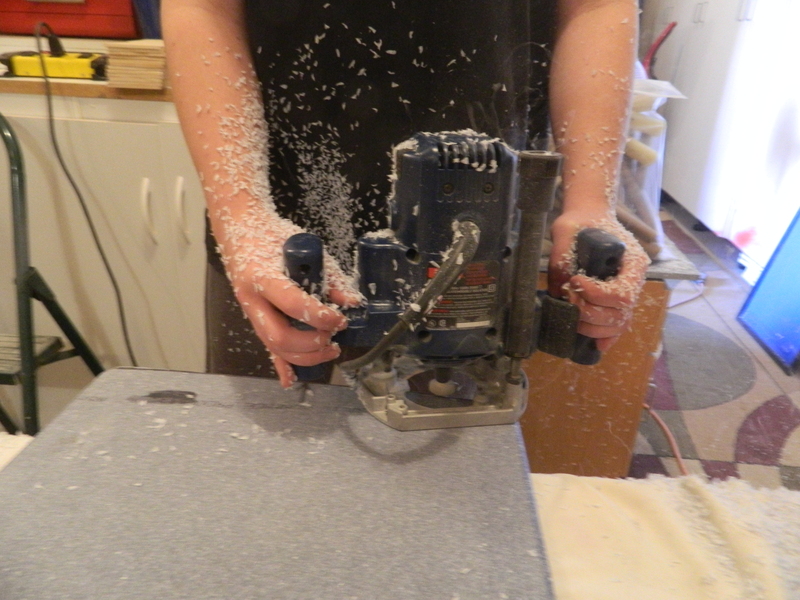 The one thing that we did notice, however, is that working with the Corian results in a LOT of ‘saw’ dust. 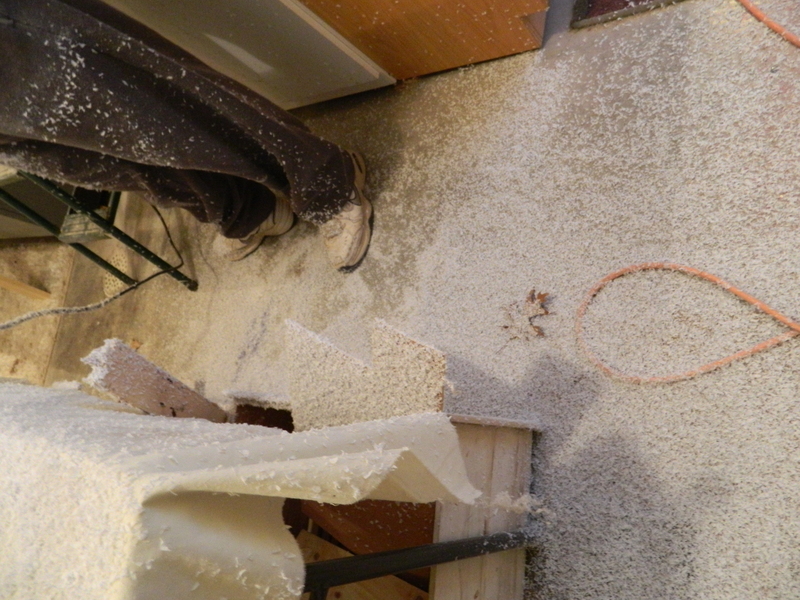 The workshop looked like it had snowed! 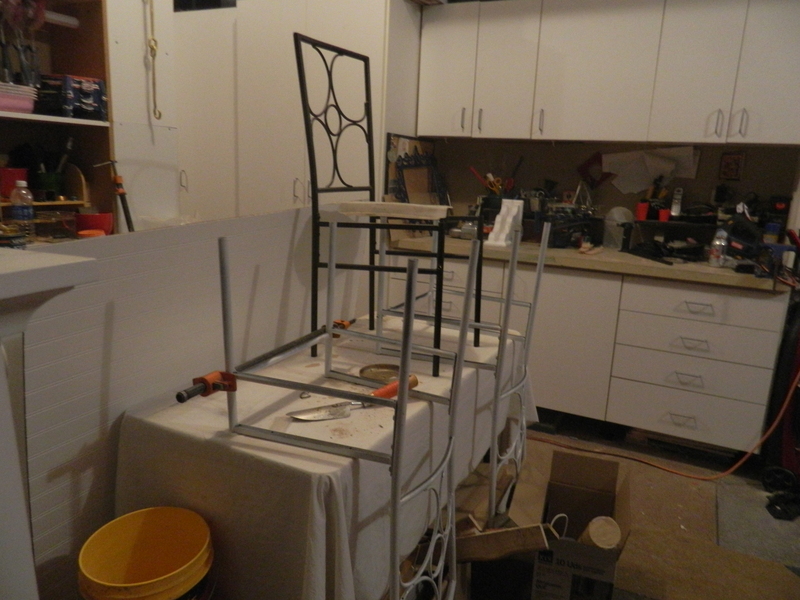 I didn’t want the seat to sit directly onto the base of the chair seats; since the previous seats were actually upholstered, the flat pieces didn’t exactly line up right with the exposed hardware on the chair. 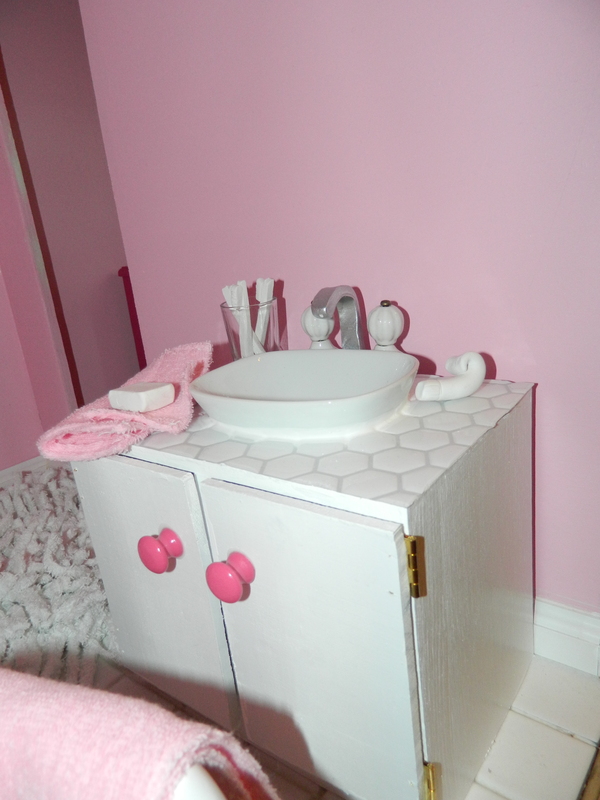 By having and using the right tools for the job, the project went very well. 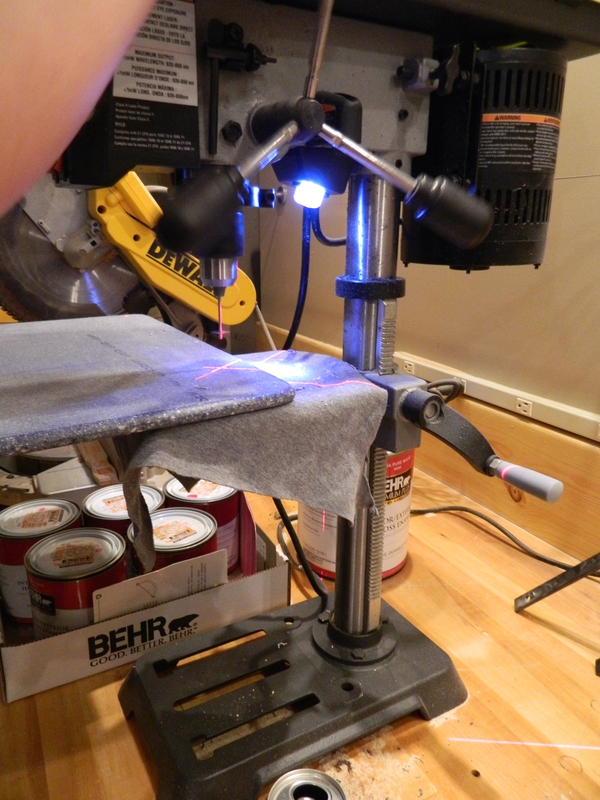 Here is The Kid using our newest addition to the workshop, the drill press. SUH-weet! Here he is in the final assembly. Note the nice, smooth, rounded edges. 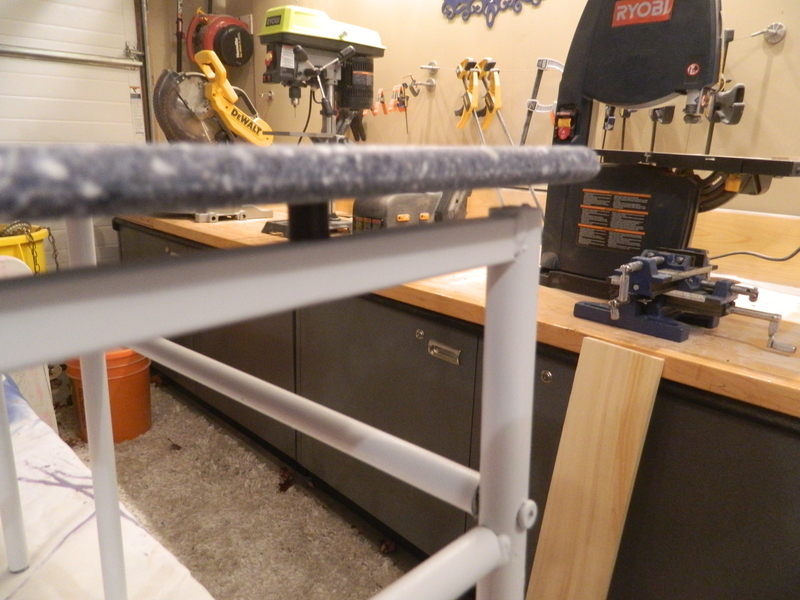 And interestingly enough, by routing the edges (top and bottom), it actually gave the edges a polished finish. Nice, happy accident! By using some spare hardware(found when reorganizing the garage a week ago), I was able to give it a little more ‘polished’ look. And gave the necessary height for sitting at the table. 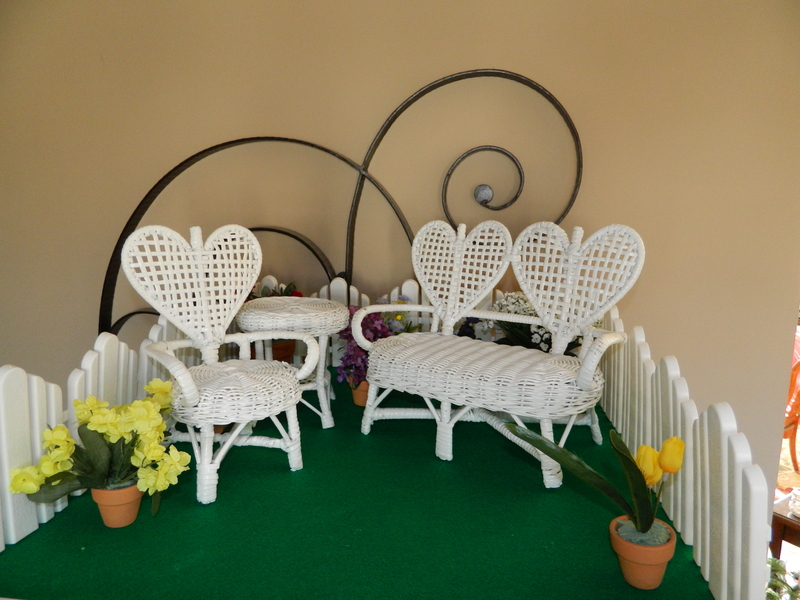 The final detail was to add rubber ‘feet’ to the chairs, to protect the floors that the chairs would sit on. 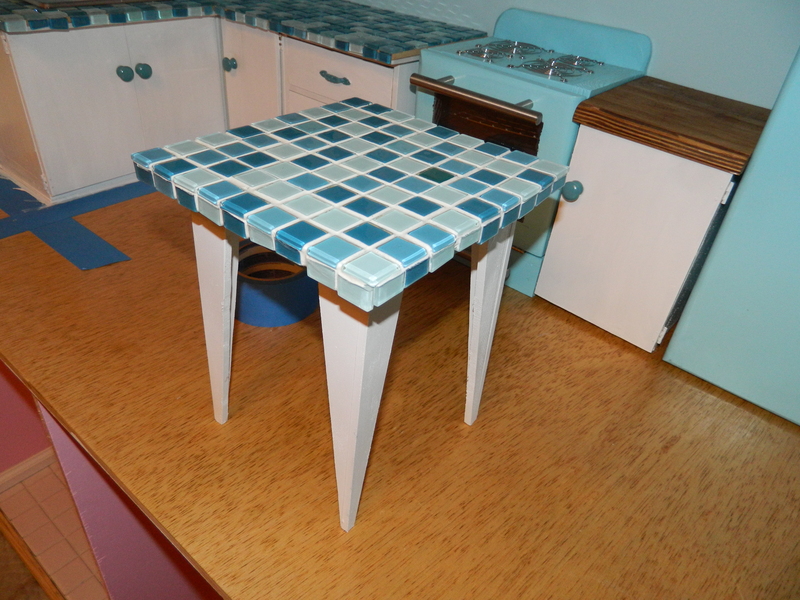 More about the table: we had previously cut and glued a 1″x8″ on the back side of the table. 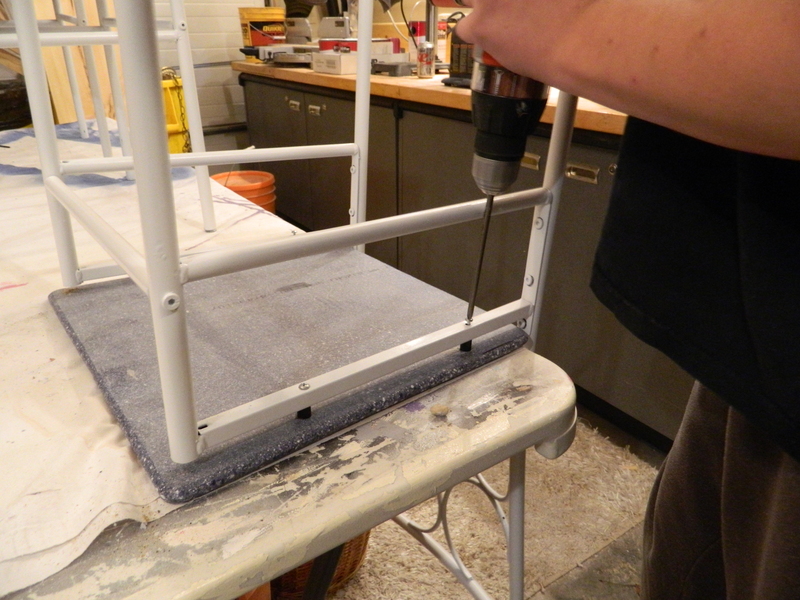 Then two supports were added to the top of the sewing machine base, allowing the table top to be bolted onto the counter surface. This could be beneficial for the person or family that buys it, allowing for easier transport. Did I happen to mention that this stuff is heavy! And it has a nice solid feel as well. 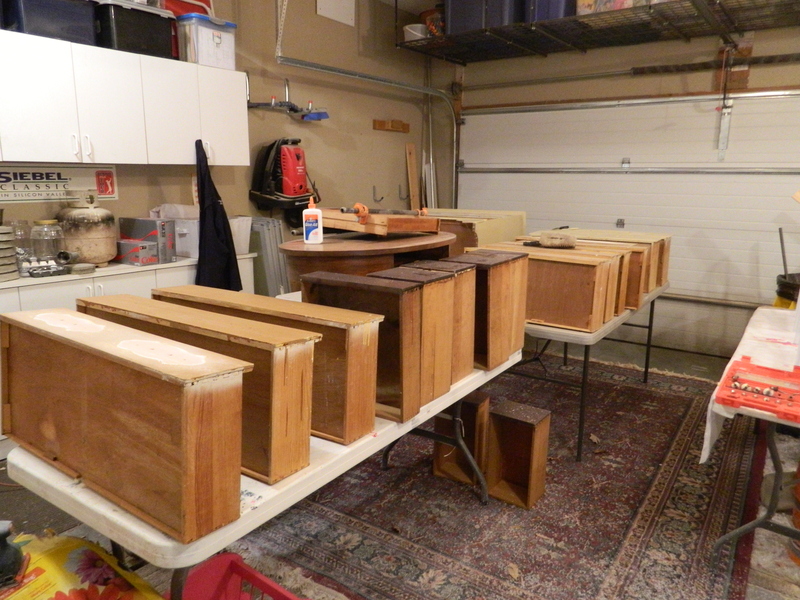 In between helping him, I was also prep’ing an additional 5 or 6 more projects… here are the drawers all being sanded and hardware holes being filled. The Kid has been tasked with putting the first couple of coats of primer on all of these now that I have gotten the prep work out of the way. 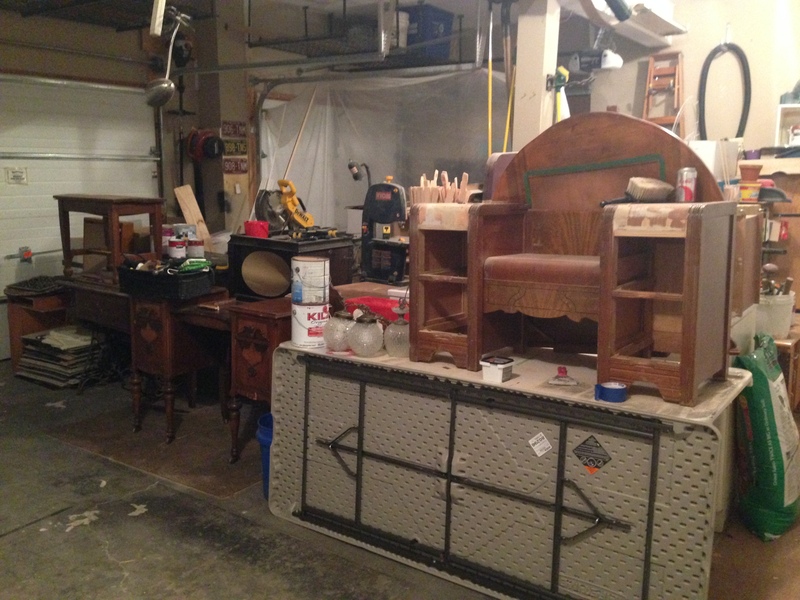 All of these pieces of furniture are all wood and it makes the chore of preparation that much easier. 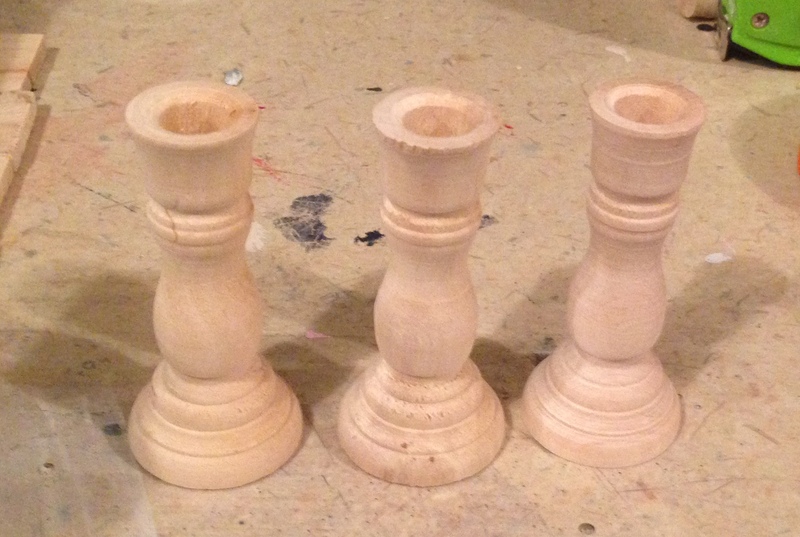 Oh, and by the way, real wood pieces are light. I think a lot of people mistakenly think something is more ‘solid’ or more ‘wood’ if the piece is heavy and that generally is not true. What weighs so much is the glue and the layers of particle board or composite wood. Most of these pieces I can move by myself if I take the drawers out ahead of time. Another thing I really like is that some of the older pieces come with wheels attached and you gotta love that! So, a few more photos as I close this post. If you recall, the third stall of the garage is where my sports car (you can see it in the background of this first photo) is stored once snow has fallen. And I’ve heard that there is an “arctic blast” predicted for the end of November, so I have to get projects done and sold (and delivered) very soon. Off to get this listed for sale on CraigsList. My kitchen is red (as you may know) or I might be tempted to keep this one for myself! 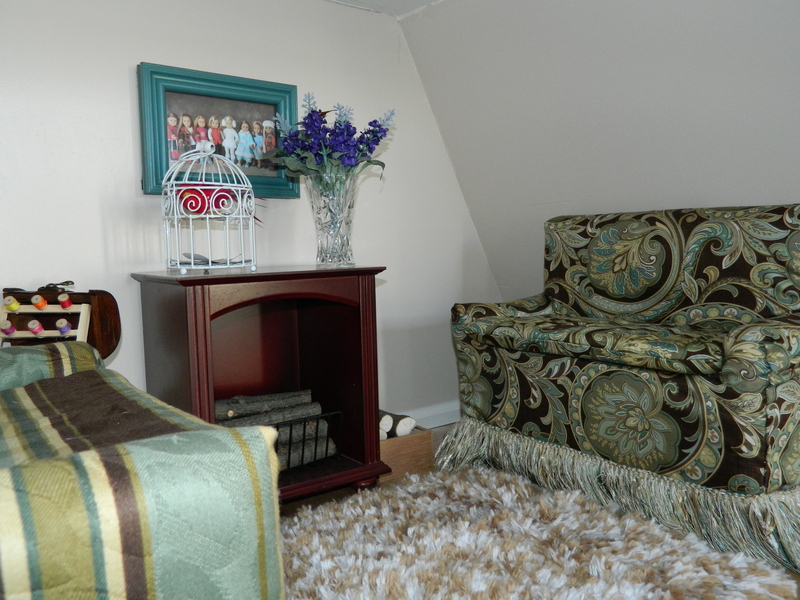 A while back I ran across some decorating schemes using paint sticks. I’ve been using paint sticks for many things, from whole projects to repair. The one I am going to show you today was actually The Kid’s idea. He came up with the idea and did all the work. I am so impressed, and happy too. 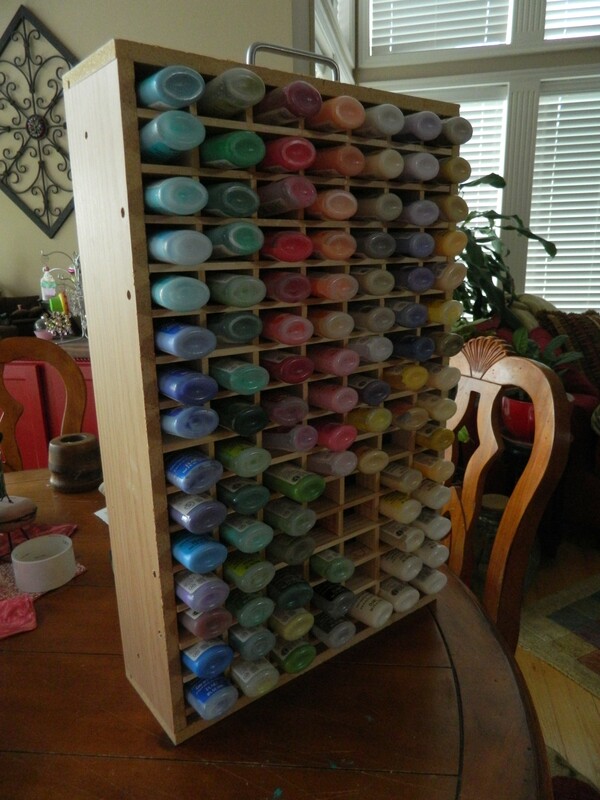 See, this is how I’ve been storing my glass paints. I started with those tubs, left over from cookie dough, but I soon filled them up and expanded to a small cardboard box. But when that overflowed, I knew I would have to do something a little more ‘constructive’. I started talking about it with The Kid, mentioned that I had a few dresser drawers that might work, but left the design and build to him. This is a bunch of paint stir sticks. Lots of cuts and glue. But this is so cool! 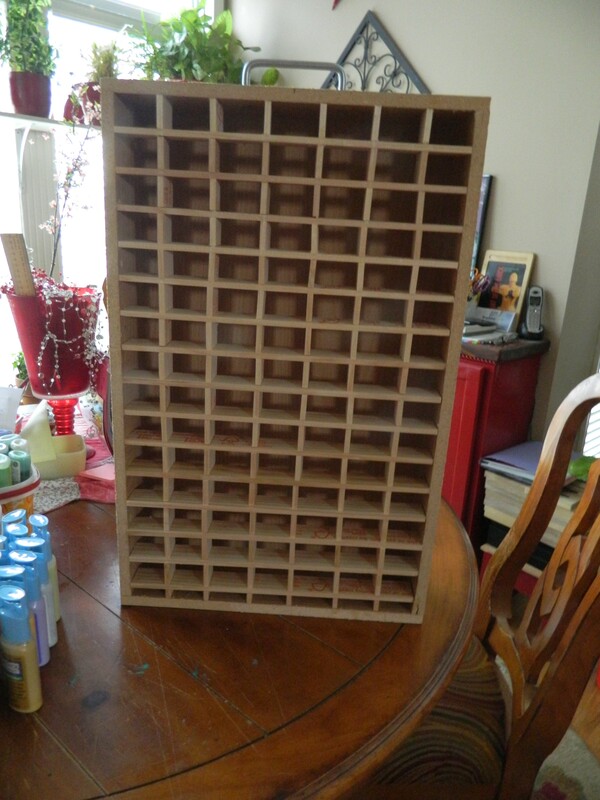 I loaded it with the paint bottles head in, so that I could see the color from the bottom. It also keeps the glue at the tip, which is handy since you’re not supposed shake this paint, so keeping the paint at the tip makes it easier to use right out of the box. I buy paint from Home Depot constantly, so I don’t feel bad about taking a handful each time I go it. You can see the branding in orange paint. Here it is loaded up. The dividers are placed with just a hint of a downward angle, to keep the bottles from falling out when moving it. He added a handle to the top to move it easily. This is a little chart that I put together (work in progress) that shows all of the different colors of paint dry. 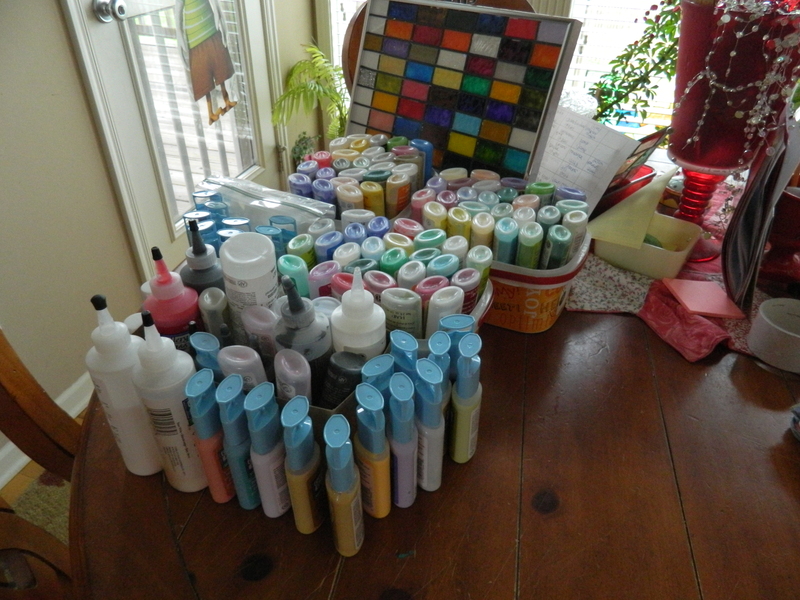 I have found that this is essential, as many of the colors look nothing like you might imagine they would be dry. 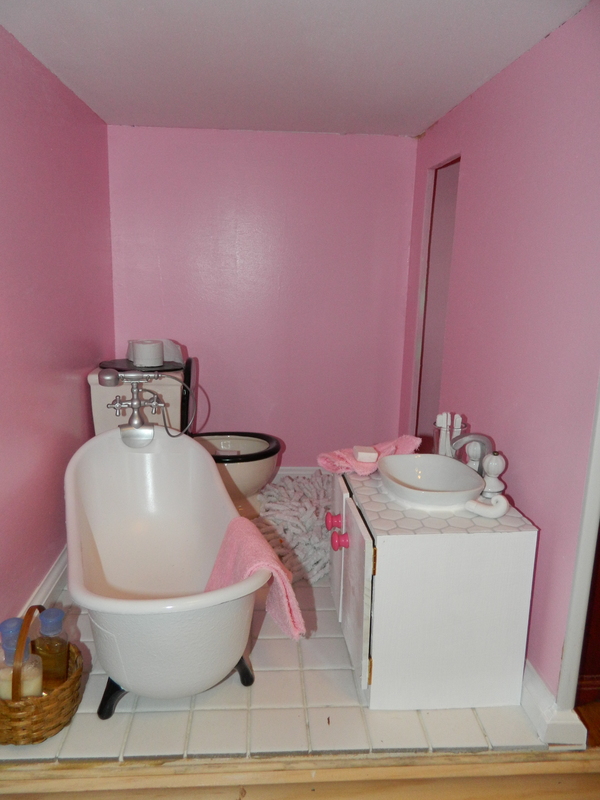 I have had to remove some paint on a couple of projects when I found that the color dry was nothing like the color wet. 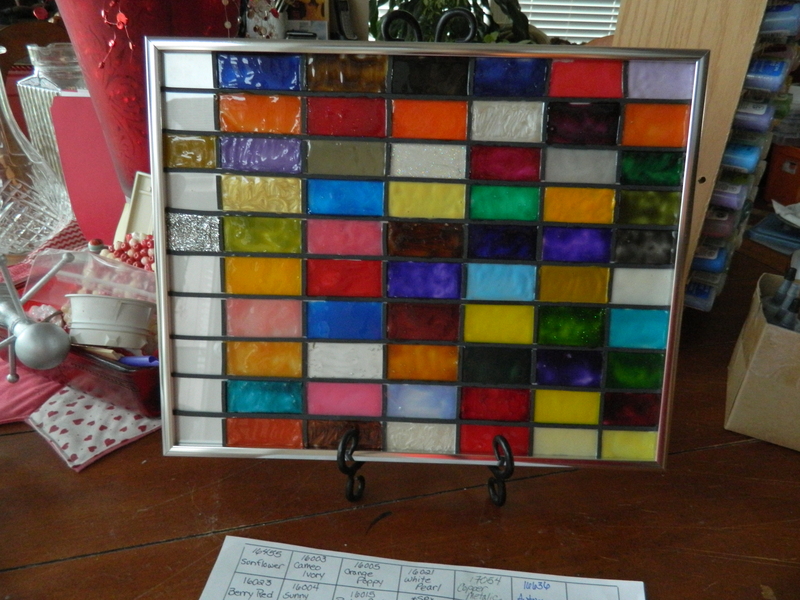 I have a list of the colors and their numbers that gets stored behind the frame. Its an interesting piece of art all on its own, I think. So, I had promised to write a few posts about what I use paint stir sticks for. This is the first. 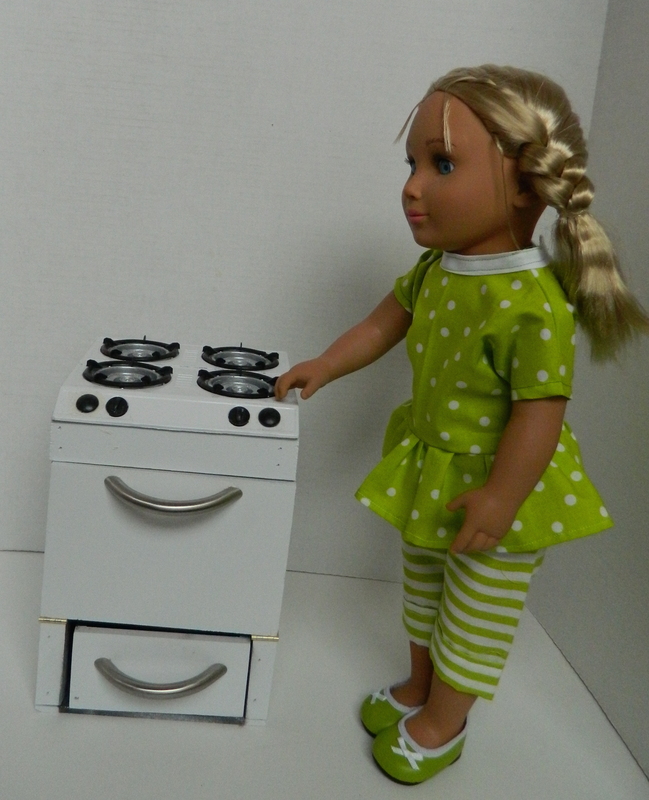 I also used them a lot when building the doll house, especially in the kitchen. I glue them side by side and then use them as thin, yet strong boards. 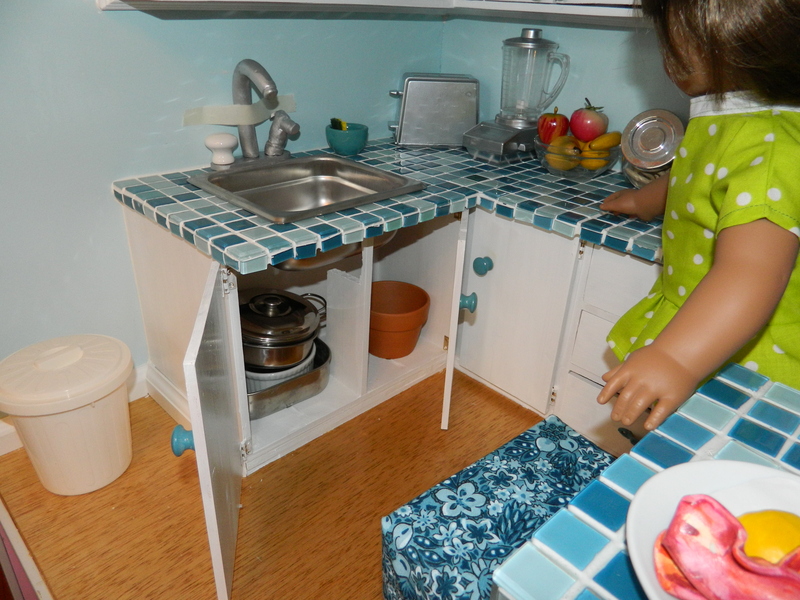 In thess photos, the fronts of the bottom cabinets and the little cabinet next to the fridge were built using the stir sticks. 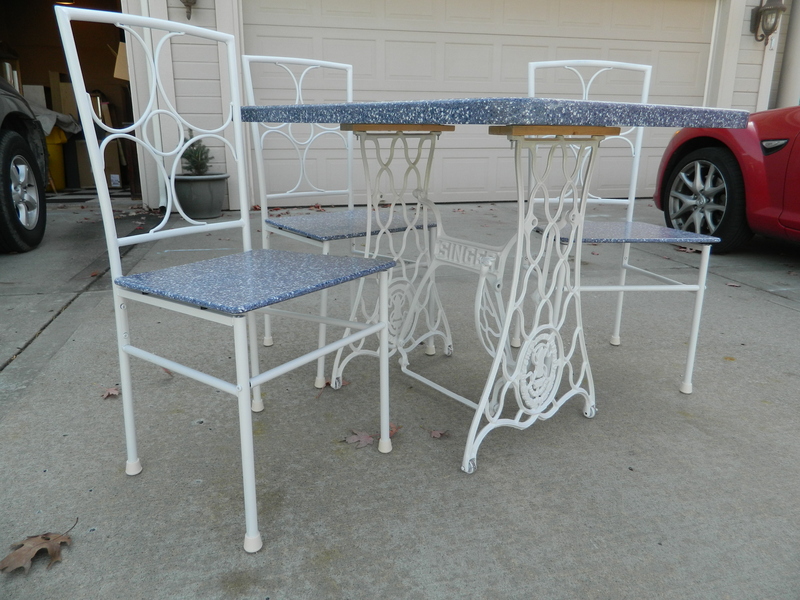 Also the pub table and stools. They are made of 100% pine, so they are wood, and can be used in any way that one would use wood. At least in small portions. 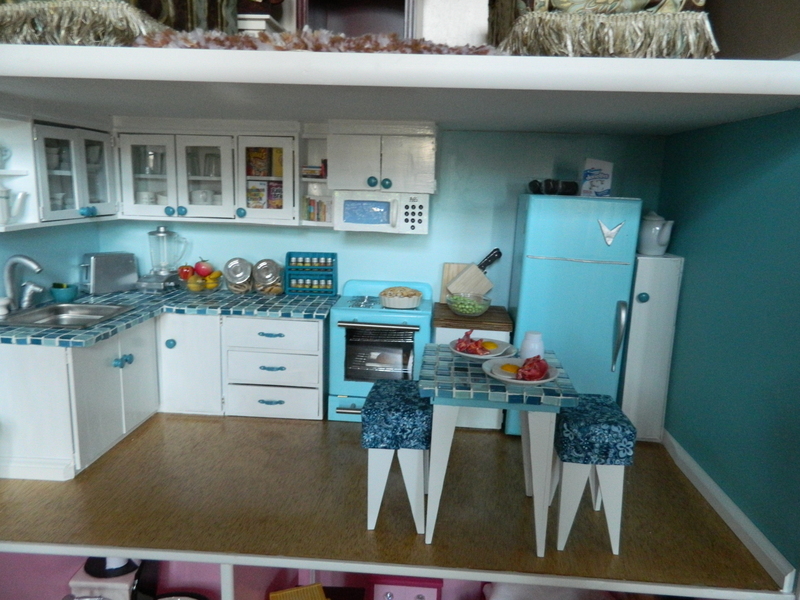 Which when working in the scale of doll houses, is perfect. 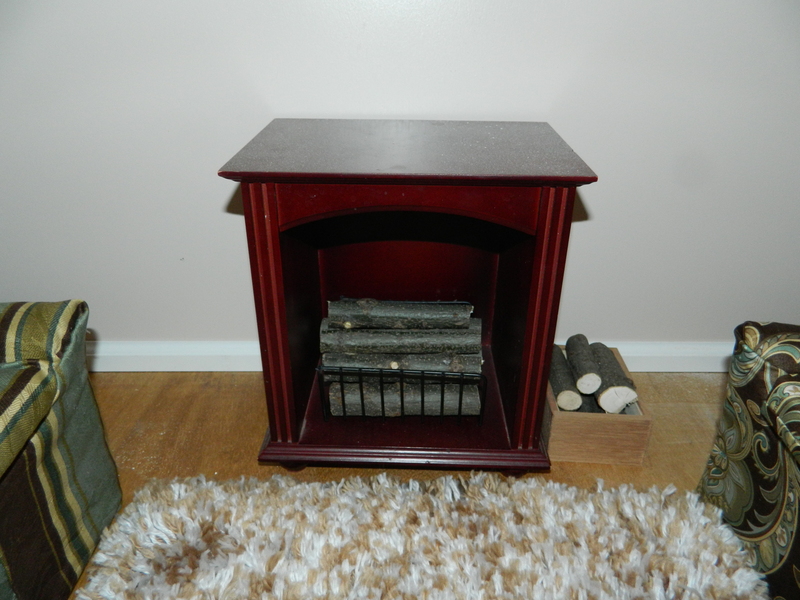 The little wood box next to the fireplace was another project. I’ve made numerous and varied sizes of boxes, sometimes just to hold supplies. 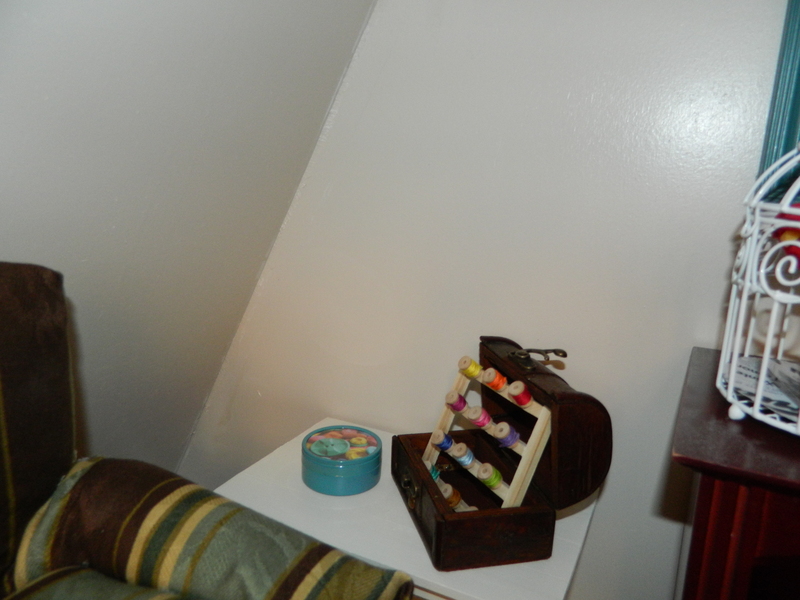 The doors and shelves were a perfect place to use the paint stick wood. Nice and thin, yet strong and paint-able. The perfect size when working in miniatures. I find that whenever I go to Home Depot – which is often – I stop by the paint department (if I am not already going to that department specifically) just for a handful of sticks. And sometimes I even use them to stir paint! We’re having a wet and cool stormy day here in the Midwest and I am thinking that not much is going to get done. At least not anything outdoors. PS…for those interested, I am not being paid for nor sponsored in any way for the mention of any products or stores in this post. 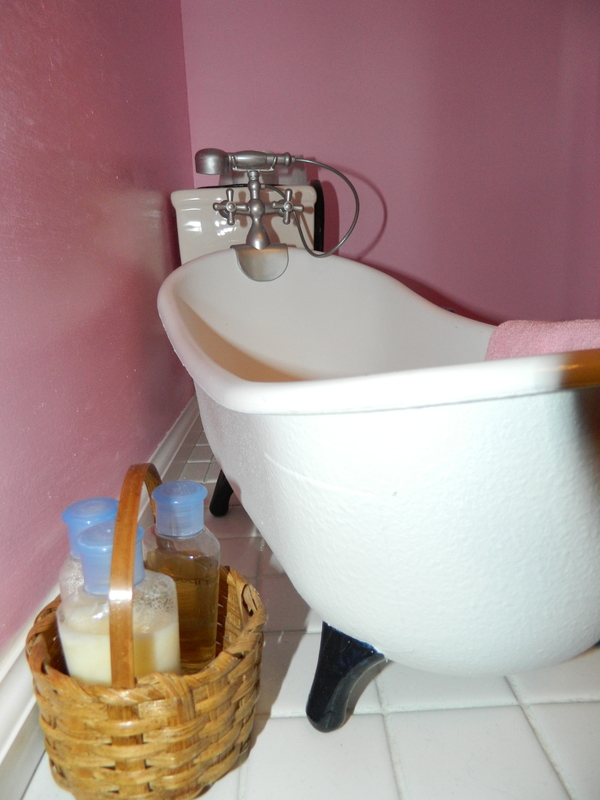 I just like the way that these particular products work and want to share with you! The Weather is Just Not Co-operating. Argh! Officially, spring came last week and with it, a couple of days of temperatures in the sixties. Windows open, doors ajar and lots of work in the garage. That lasted all of about two days and then it has dipped down into the ‘too cold to do anything fun outside’ range of temps. And now, today, they are calling for snow. Snow! Too cold for even working in the garage… and I have so much that needs to get done. 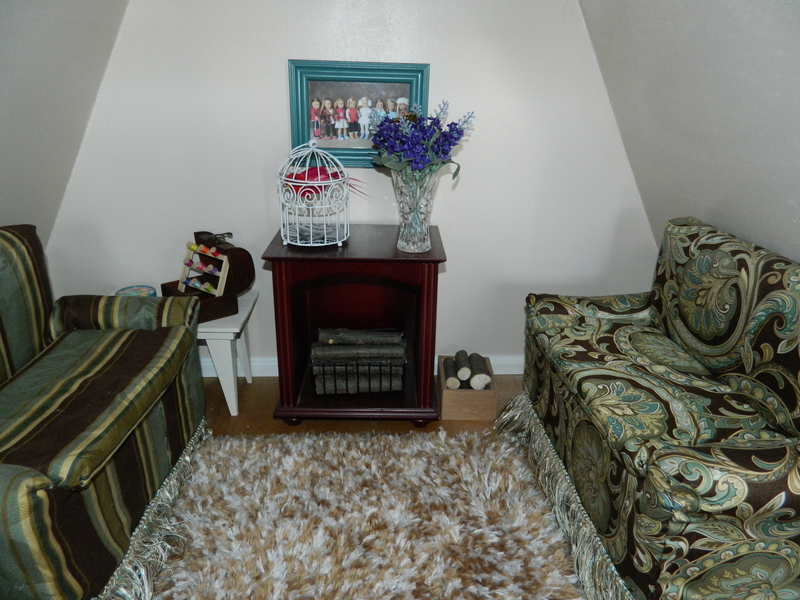 I picked up another vanity and a stool, but that leaves me one stool/bench short. Just like I started! 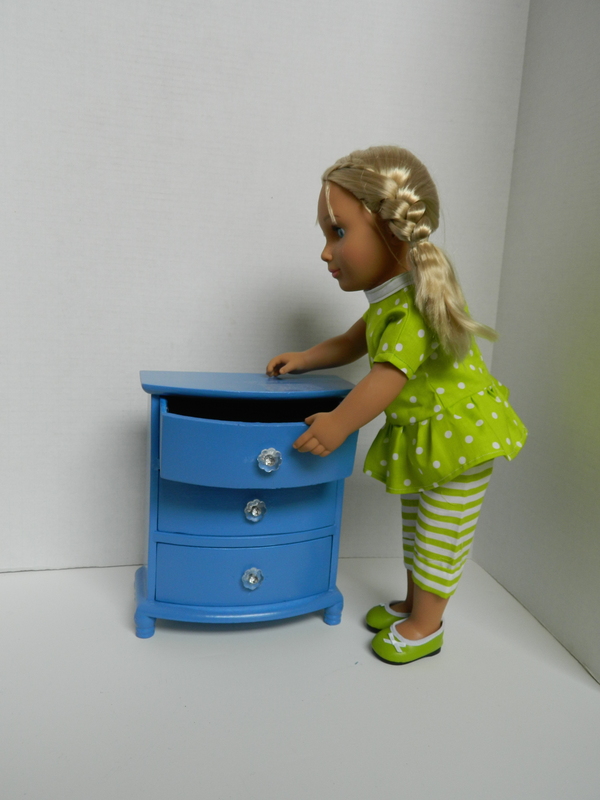 Over the last few months, I have been working on dollhouse furniture and clothing, getting ready for the ‘Dolls & Cupcakes’ website. I seem to be totally dragging on getting the website up and running, so I opted to put a few pieces on eBay, just to see how sales would be. So far, they’re not getting much attention, not as much as I thought. 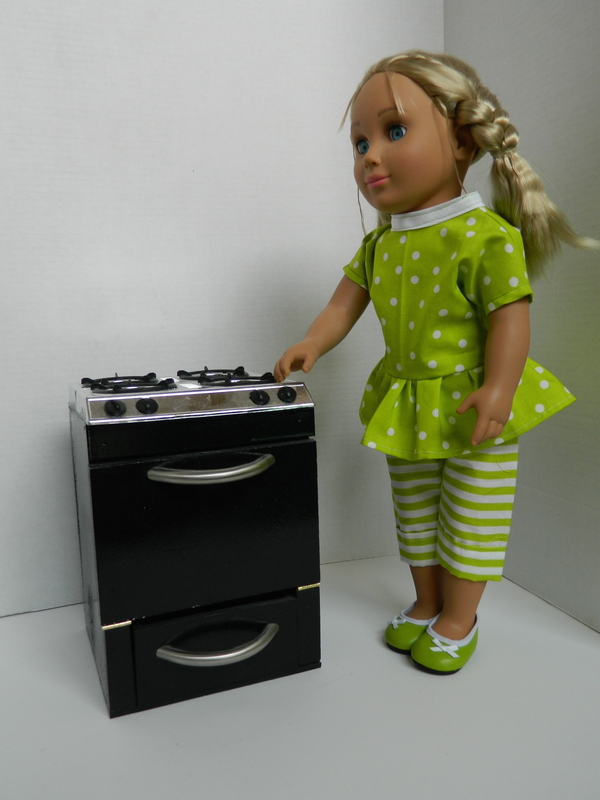 Maybe the American Girl craze is waning? This weather is so non-conducive to working, but I am going to do my best to get something done today. Hope you’re having better luck than I!